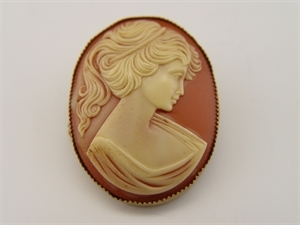 Available is a pretty vintage Cameo pin with a gold color metal saw tooth banded edge. I am not sure of the maker on this one. The coral color background compliments the creamy color of the Athena style maiden. I am not sure if this is real corral or some sort of plastic. Please check the pictures for more information. The flip clasp on the back is damaged but will still hook. The cameo measures 1 ½” x 1 ¼”. You are buying this piece “as is”.